While not an absolute necessity, video baby monitors are nonetheless a reassuring tool for anxious parents who want assurance that their precious little one is safe and comfortable. 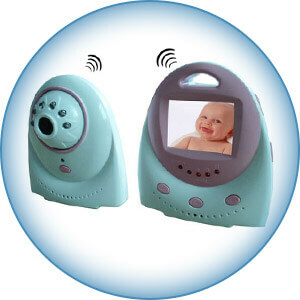 Typically baby monitors are two components: a receiver (the parental unit) and a camera (the baby’s unit). As various monitor brands and models come with a variety of features, capabilities and price tags, parents and caregivers should evaluate products to determine what is best suited for the household’s needs. Perhaps the most important addition to the newest generation baby monitors is a smartphone app for parents to look in on baby from across town or the world. Today’s Wi-Fi technology permits an observer to remotely view and control the monitor camera from a smartphone or tablet. This capability can also eliminate the need for a separate, dedicated receiver. It’s a practical choice for those who have unlimited data plans for their personal communication devices. The best example of such device is Withings baby monitor. Night vision from infrared cameras should be high on the list of features, especially in light (so to speak) of the fact that much of baby’s sleeping will occur in the darkness of night. Note that there is a difference between video baby monitor cameras that work in “low light” environments and those that work in darkness. Cameras with active infrared night-vision systems use either a charge-coupled device (CCD) or active pixel sensors (CMOS) to convert the digital signal into a high quality monochrome image seen from the monitor’s receiver. Cameras that use image intensification are not “night vision” cameras. If this capability is an issue, be sure to check the product’s specifications. Another desirable attribute is two-way “talkback,” allowing the parent or caregiver to speak to a baby via a speaker. Many parents find that the sound of their soothing voice is sufficient to comfort a baby or help the child to sleep, preventing a trip to the nursery and freeing parents to continue with work or leisure. Other amenities are night lights, a low-power battery indicator and an “out of range” warning for the receiver. A handy power-saving feature is VOX — a feature that puts the unit into standby until activated by baby’s voice. Another convenience often overlooked is a belt-clip for the receiver, providing “hands free” portability. Do your homework! Almost all video baby monitors are manufactured in China, so superficially there is a uniformity in appearance to most brands on the market. However, manufacturers over the past year or so have introduced newer models loaded with features that come with a hefty price tag. Should a parent or a caregiver decide that it’s necessary for a monitor to report the nursery’s air temperature and humidity level or provide a reminder for baby’s feeding time, they’ll find a monitor that meets their needs. But some parents find that pricey baby monitors have a plethora of features that they’ll never use and, more importantly, cost money that would be better served on baby’s other needs. Know the transmission signal protocol and the range of the baby monitor. 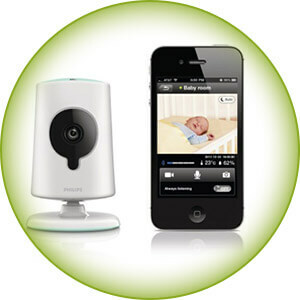 Most newer video baby monitors use digital wireless technology to communicate between camera and receiver. Older analog models, rare nowadays but still available due to their significantly lower cost, are susceptible to all sorts of interference. Their signal can even be captured by an RF scanner or comparable wireless device. 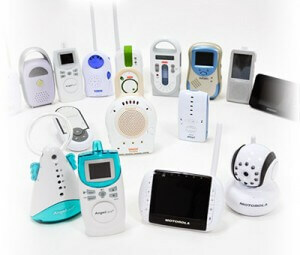 Many household appliances and gadgets including older cordless phones, TV sets, fans, and A/C units with remote controls, Bluetooth devices, laptops, game consoles, other baby monitors and microwave ovens use 2.4 GHz frequency, potentially causing interference between the parental and baby units. This interference is particularly prevalent in densely populated areas such as apartment buildings and urban locations. To minimize interference and static, choose a video baby monitor with Automatic Frequency Hopping System (FHSS) or Digital Enhanced Cordless Technology (DECT). They transmit encoded data, minimizing the chances of signal interference and interception. Don’t forget to check for other DECT devices (like cordless phones) in the household that may transmit on the same frequency band as the new baby monitor. Signal range and strength are also imperatives to examine as there is a wide variance between products, particularly when the signal must pass through several walls to reach the receiver. Don’t buy a non-branded cheap product only to find that the signal won’t reach the basement or the other side of the home. Another functional concern is the parental unit’s battery life. One of the most common complaints cited about video baby monitors is that their battery power is short-lived — some last only a couple of hours. Even models with rechargeable batteries can drain quickly. Again, shoppers are advised to do their homework on products — subscribers to consumerreports.org may receive baby monitor ratings, including battery reports, for selected models. Don’t be swayed by a product’s bells and whistles. Make sure to examine the practical applications of a baby monitor — its durability, signal range and strength and battery life. Know what the baby monitor is needed to do. If a parent or caretaker needs to keep tabs on two different children, choose a monitor that has a split screen for both cameras (see VTech baby monitors). Attention to details such as these will help ensure that a parent purchases the monitor that best serves their individual circumstances. As of October 2014, these were the five top selling video baby monitors on Amazon. All come with free shipping and free returns except as noted. Price shown is current and is subject to change without notice. Pricing table with an Table ID of "top51" is not defined. * Average price. The prices may vary. A final caveat — it’s a rule of thumb that the more features a monitor offers, the more tech-savvy the user should be. According to reviews posted on Amazon, even IT professionals can have difficulty provisioning a baby monitor to do exactly what is wanted. When looking to buy a baby monitor, a valuable resource is the reviews posted by Amazon customers. Shoppers will find thousands of reviews written by customers and many are updated to reflect the customer’s feedback about their purchase after using the product for an extended interval. To save even more money buying through Amazon, consider their outlet store to find bargains on overstocks, clearance items and markdowns. Or buy from Amazon Warehouse Deals to find discounted items. As mentioned previously, the consumer should determine what baby monitor features are needed for their particular situation and then compare products to find the best fit for baby and parent or caregiver. Note that many products offer free returns when purchased through Amazon — if a baby monitor doesn’t meet expectations, return it. With the vast number of baby monitors available, the consumer is certain to find one that meets his or her standard. We hope this article will help you to make the right choice. We are grateful for sharing this post with your friends on Facebook, Twitter & Google+.